Madico U.V. film prevent color deterioration of furniture, paintings and objects and the damage caused by aggressive U.V. rays. 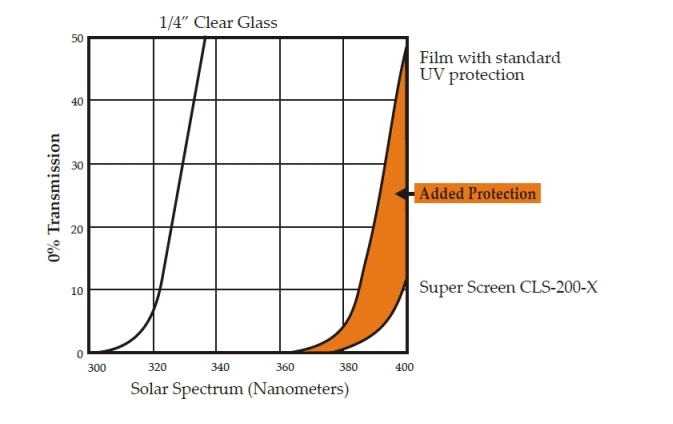 UV radiation is the portion of solar radiation between 190and 380 nanometers. This intensive energy is quite damaging. The UV-C is completely absorbed by the ozone layer in the atmosphere. The UV-B are partially absorbed from the atmosphere. The UV-A generally passes through the atmosphereand the glass. UV-A and UV-B contribute to the discoloration and deterioration of materials and, in an overdose, can give rise to carcinogenic effects on our skin. The Madico Anti U.V film, thanks to their special and innovative composition, screen almost 100% of those harmful rays, maintain unchanged the transparency of the glass. One of the problems foundin most stores, malls, museums, and homes is discoloration, deterioration and degradation of materials, goods, products, artwork and furnishings that are exposed to the aggression of solar UV radiation. The Madico U.V window film are ideal in all these cases. caused by Ultra Violet light in sunlight. solar heat all cause fading and damage.